My fascination with Erythroniums began at an early age. When I was a teenager I stumbled across a small population of Erythronium oregonum in the hills near our home in the suburbs of Seattle. In the Seattle area, this species is very rare and local. 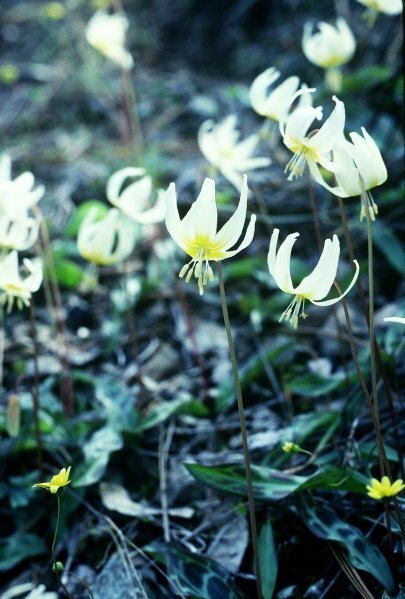 I was fascinated by the idea that there could be a wildflower growing so close to my home with the same habit and form as the ethereal avalanche lily (Erythronium montanum) that carpets subalpine meadows in endless quantity in the Cascade and Olympic Mountains. 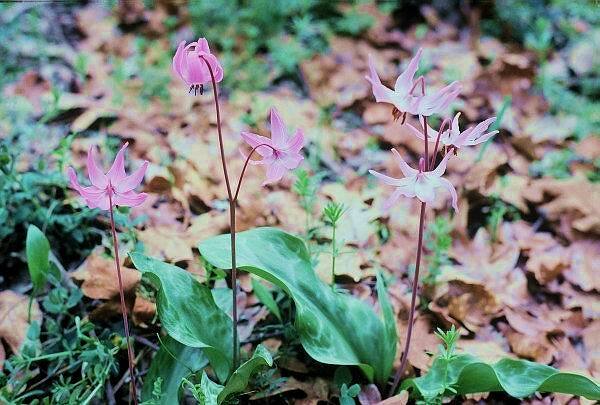 At some point I began to read about the amazing diversity of color and form of Erythronium in western North America. Flowers of pink, lavender, and yellow, in addition to white; leaves mottled or plain; flowers single or profuse. 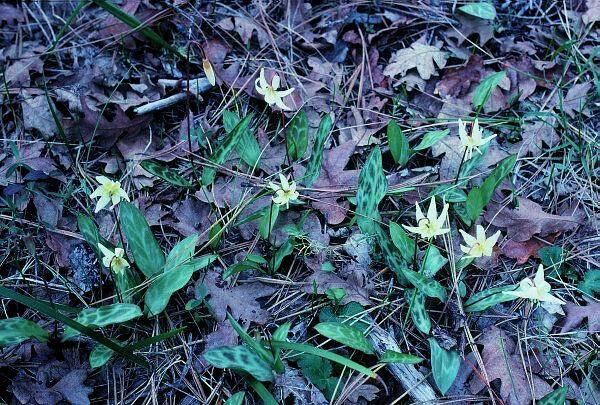 And furthermore, western North America is the geographic center of species diversity in Erythronium. Of the 32 (by my count) species found worldwide, 22 species are found in western North America. It was more than 25 years ago that I began my quest to see and photograph all of the western Erythroniums in their natural habitat. This is not as easy as it sounds, many of the species are rare and local endemics, and seeing them requires a bit of sleuthing and difficult hiking, not to mention a good sense of timing to find them in flower. This is the first in a series of postings that constitute a log of my explorations between March and July 2005, to see how many Erythronium taxa I could visit in the wild in a single calendar year. The title of this series is an allusion to Mark Obmascik's 2004 book, "The Big Year: A Tale of Man, Nature and Fowl Obsession". That book is an account of three bird watcher's quest to observe as many North American birds as possible in the span of a single calendar year. In this example of "extreme" birdwatching, one man spotted 745 bird species, setting a new record for what the author describes as either the greatest - or the worst - birding contest of all time. By taking on western Erythroniums, I was setting my sights much more modestly, and of course, much less obsessively. On March 16th, 2005, I began my quest by heading south on Interstate 5 (otherwise known as I-5). My home in Eugene, Oregon is in a central location to have easy access to Oregon's Erythronium diversity - all of the 10 species native to the state can be found within a 2 or 3 hour drive of Eugene. 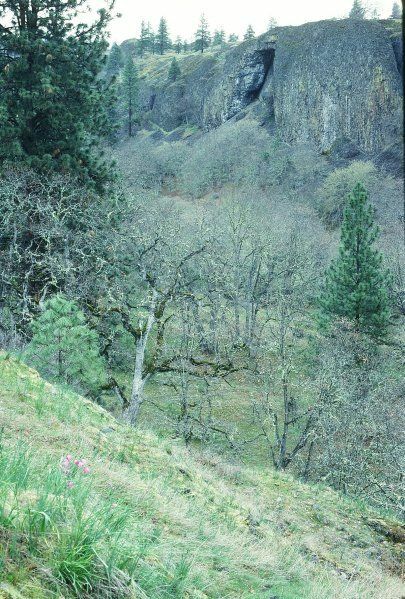 Southwestern Oregon - specifically the Rouge River Valley - is one of the earliest places in the state to see flowering Erythroniums. I actually made two visits to SW Oregon in March, on the 16th and 31st, in order to see all of the low elevation taxa. Erythronium hendersonii is actually the most common species in SW Oregon. If you have good eyes, you can see it in bloom along the side of I-5 between Grants Pass and Medford. It is also the earliest blooming species. 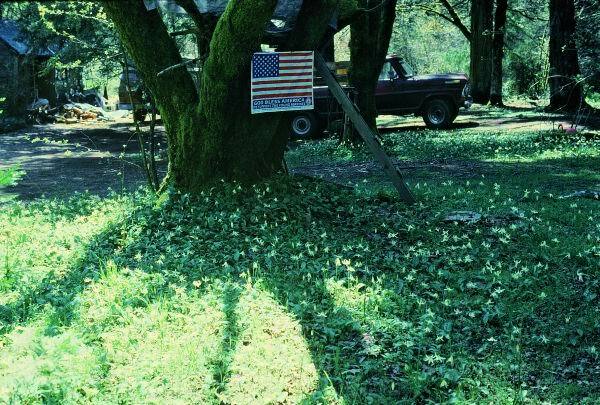 I found it first in the vicinity of the town of Rogue River, where it was growing in a dry woodland under oak (Quercus garryana), madrone (Arbutus menziesii), and ponderosa pine (Pinus ponderosa). Note in the photograph the side-by-side occurrence of a lighter and a darker colored form of this lovely lavender-flowered species. The flowers have purple styles and anthers, and the lower part of the petals (on the inside of the flower) form a deep purple ring. Another wonderful spot for Erythronium hendersonii is the trail to the "Enchanted Forest", in the nearby Applegate River drainage. Carpeting the ground under a lovely canopy of lichen-draped oaks are both Erythronium hendersonii and Dodecatheon hendersonii. Both have flowers in shades of pinkish lavender, and both species are named after Louis Henderson, an important early botanist in the Pacific Northwest. Erythronium hendersonii has grown very well for me in my Eugene garden, where I was able to get the first flowers in the third year from seed. I suspect it likes my somewhat clayey soil and a lack of summer irrigation. Another taxon I wanted to study in more detail is Erythronium oregonum ssp. leucandrum. Elmer Applegate described this subspecies as a form with white anthers, in contrast to the solid yellow anthers of typical E. oregonum. I was not able to find it at the type locality in Rogue River, but I was able to find it about 20 miles away in the town of Wolf Creek. Here is a close-up of a flower; notice the white anthers, and also the creamy-colored petals. Next month I will show photos of E. oregonum ssp. oregonum, which has pure white flowers and yellow anthers. "Pure" ssp. leucandrum is found only in SW Oregon, but the taxonomy is complicated by the fact that many populations further north in the Willamette Valley have the cream colored petals but anthers that are pale yellow, that is, neither white nor deep yellow. This appears to be a case where the plants have outwitted the taxonomists. I first found Erythronium oregonum at Wolf Creek in 1980, and I was amazed by their abundance of wild Erythroniums in the yards along Main Street. This species is still found in some quantity, but I was disappointed to see that their abundance had been reduced markedly, by a combination of excessive mowing, herbicide use, and (in the case of this yard, which had the greatest profusion in 1980), vehicle parking. During my March 31st visit, I had time to explore the Illinois Valley, home to Erythronium citrinum, and its close relative, E. howellii. The Illinois River is a tributary to the Rogue River, and it is an interesting quirk of plant distribution that there is a very abrupt transition from the area where E. hendersonii occurs to the area where it is replaced by E. citrinum. Erythronium citrinum is very similar morphologically to E. hendersonii, except that E. citrinum has white flowers with a yellow center. Also the anthers of E. citrinum are white rather than yellow. I found a profusion of E. citrinum in the Star Flat area west of Selma. It was carpeting hillsides along with a little annual composite, Crocidium multicaule, a species of Delphinium, and the lovely little Trillium rivale. This area has become famous (or infamous) for the 2002 Biscuit Fire and its aftermath. 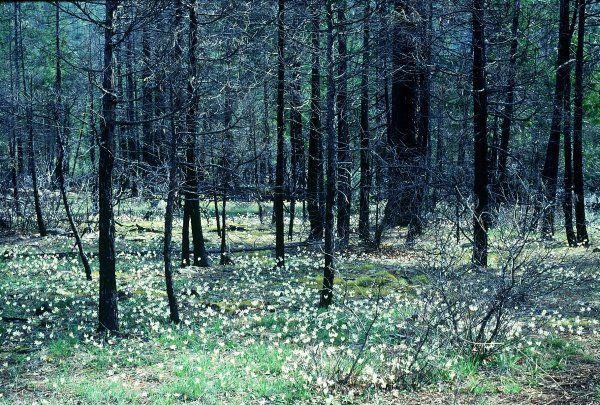 Between August and November 2002 a large wildfire burned much of the Kalmiopsis Wilderness and the adjacent area. The perimeter of the fire occupied over 500,000 acres, and was the largest wildfire in Oregon's recorded history. After the fire, the burn area became subject to a furious political debate, and opportunistic politicians have used the fire as an excuse to expand logging into roadless areas and other sensitive habitats. The general public, having learned their fire ecology from Walt Disney, has been easily hoodwinked into thinking that the forests need human assistance to "recover". And to pay for the "recovery", the US Forest Service must first cut down the remaining trees. Well, I digress…. However, there is a point to be made here that is well illustrated by the Erythronium citrinum display at Star Flat. The paved road formed a fire break, the slopes above the road burned more or less completely, while the slopes below the road did not burn at all. There is a very marked difference in the abundance of E. citrinum between the burned and unburned areas. In the unburned area, the forest canopy is rather thick, the understory is well shaded, and as a consequence, a large percentage of the E. citrinum plants are vegetative. Flowering plants are mostly scattered here and there. 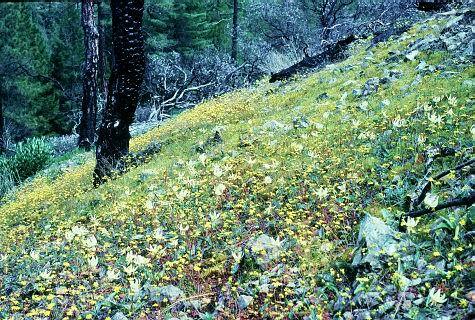 In contrast, on the uphill side of the road, between the charred trunks of burned trees (some living, some dead), is a profuse display of flowering E. citrinum. 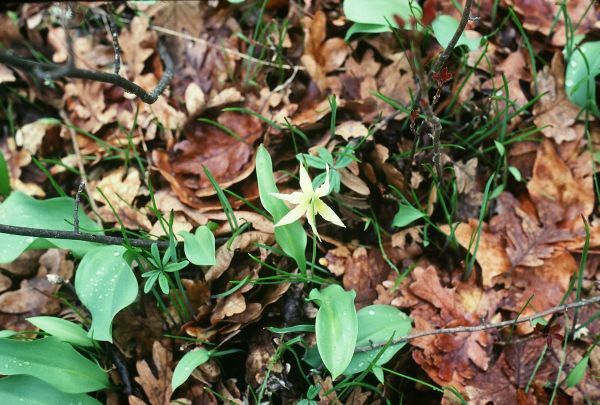 The point here is that for Erythronium citrinum, as well as many other native plant species, fires that occur in undeveloped areas are not the sinister force that people have come to fear. In fact, many flowers are adapted to occasional or even frequent fires, and the absence of fire from the landscape may actually have a detrimental effect on the native flora. Also, in the absence of frequent but low intensity fires, the forest becomes so dense that when a fire eventually does occur, the flames are much more intense and damaging that what would have occurred under a more frequent fire regime. I'll speak to this issue more in future installments, but one could claim, with some justification, that the greatest threat to native populations of many western Erythroniums is not development, or grazing, or removal of plants from the wild, but is actually fire suppression and the resulting ecological consequences. Both E. citrinum and E. hendersonii have fairly restricted geographic ranges in SW Oregon and adjacent northern California. 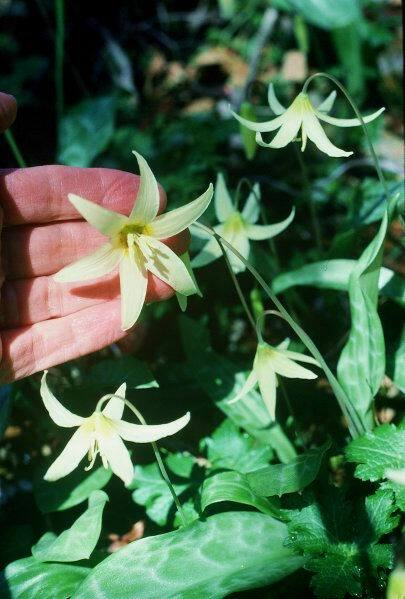 (The Oregon distributions of these and all other Erythroniums can be found online at the Oregon Plant Atlas site at http://www.oregonflora.org/oregonplantatlas.html) But even more restricted is Erythronium howellii, which is limited to a small corner of the Illinois River drainage near the old mining site of Waldo. I visited the French Flat "Area of Critical Environmental Concern" (ACEC) to look for E. howellii in bloom. This is a 656 acre protected area owned by the US Bureau of Land Management (most of the adjoining lands are privately owned). 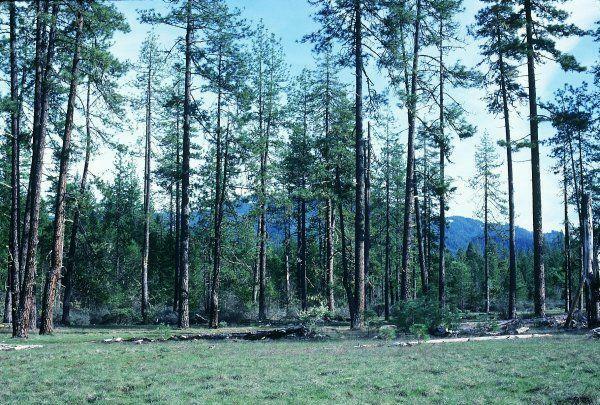 The site is a mixture of wet meadows, ponderosa pine stands, and oak groves. The site has a diverse flora with many wildflowers. I found Erythronium howellii growing near a seasonal stream under oaks. In habitat it looks just E. citrinum, and the only apparent difference between the two species is the absence of nectariferous appendages at the base of the inner petals in E. howellii. 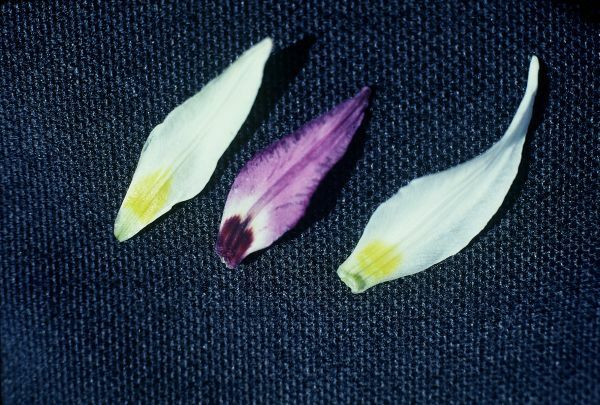 Here is a photo that compares the inner sides of petals of E. howellii (left), E. hendersonii (middle, which like E. citrinum also has the appendages), and E. citrinum (right). Erythronium howellii and E. citrinum are so similar that some people consider them to be insignificant variants of a single species, E. citrinum. This is the approach that was adopted by Flora of North America author, Dr. Geraldine Allen. I could see a rationale for considering them to be separate subspecies of a single species ("E. citrinum ssp. howellii"), but such a nomenclatural combination has not been formally proposed to date. Given that E. howellii is such a rare taxon, and that E. citrinum is pretty much identical from a horticultural standpoint, I personally don't see any need to bring E. howellii into wider horticultural prominence. I should note that both E. citrinum and E. howellii are frequently found growing on soils derived from serpentine and other ultramafic rocks. These soils are naturally high in magnesium and low in calcium, and many plants are unable to survive on these soils. Species that are tolerant of such stressful conditions are often local endemics. However, in many cases (and these two Erythroniums seem to be examples) they will grow just fine in normal garden soils, given suitable conditions of moisture and drainage. On March 23rd, 2005, in between trips to SW Oregon, I made a day trip northward to the Columbia River Gorge. It is a three hour drive from Eugene, up the Willamette Valley, through the urban congestion of Portland, and then eastward through the Columbia Gorge National Scenic Area. ow anther forms as distinct varieties, even though they have fairly distinctive geographic distributions. 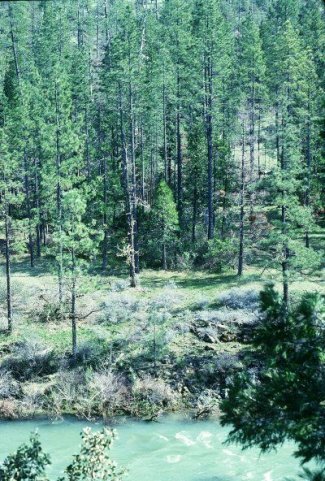 I revisited the Catherine Creek area in Klickitat County Washington, between the towns of Bingen and Lyle, where I had seen nice stands of E. grandiflorum during a previous visit. The habitat here is a mixture of Oregon white oak and ponderosa pine woodland or savanna, with numerous cliffs and outcrops. It is truly a rock gardener's (and botanist's) wonderland, with an abundance of Delphinium, Fritillaria pudica, Lithophragma, Lomatium, Olsynium douglasii, Saxifraga, Zigadenus venenosus, etc. Erythronium grandiflorum grows here not in its more typical montane to subalpine meadow habitat, but as a spring ephemeral in oak and oak-pine woodland. 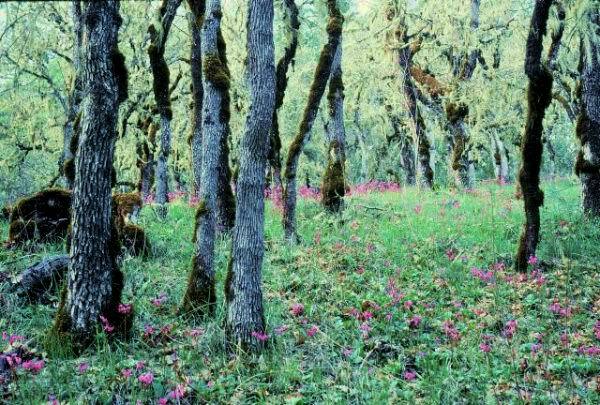 The elevation here is only about 450 to 650 ft. (about 140 to 200 meters); the Columbia River Gorge is the only place where E. grandiflorum grows at elevations approaching sea level. 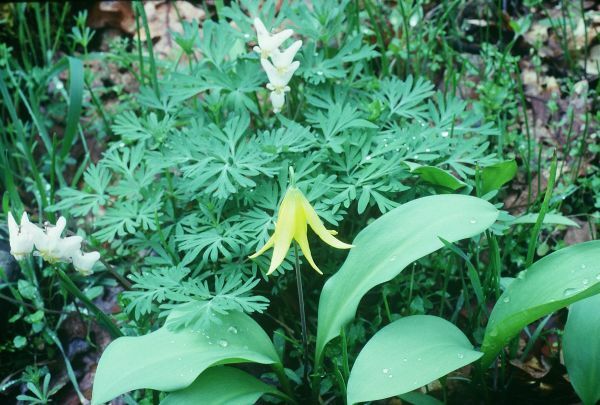 Also interesting is the diversity of other woodland wildflowers, and the presence of the Pacific Northwest form of the Dutchman's breeches (Dicentra cucullaria) provides and interesting analogy to the spring flora of the hardwood forests of eastern North America. Further up the hill I came across a little side valley in which the oak forest understory was carpeted with thousands of yellow flowers of Erythronium grandiflorum. It was a lovely site to behold. What the photograph doesn't show is that the other dominant understory species is poison oak (Toxicodendron diversilobum), a western relative of poison ivy that causes a serious skin rash for those that are sensitive to it (including myself). 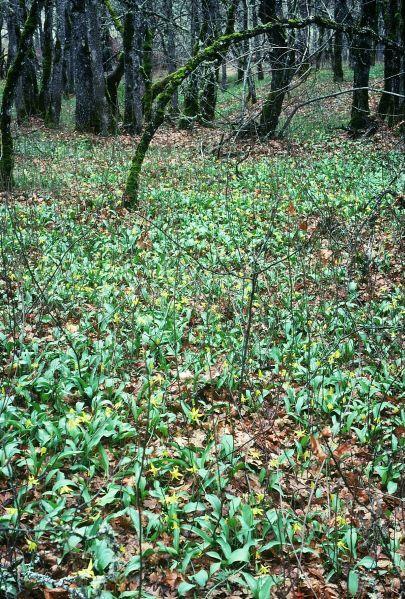 In fact, poison oak is a constant companion of nearly all of the Erythronium species that occur at low elevations in western North America. Some might say that this is the only defense against destructive human intrusion that the Erythroniums have. To close, I should mention two atypical forms of E. grandiflorum that I found at Catherine Creek. In several spots I found clumps of E. grandiflorum leaves that were suggestive of vegetative increase by offsets. This phenomenon is well known if a few species and cultivars (such as E. tuolumnense and E. "White Beauty"), but it may well be that careful observation may result in the discovery of occasional individuals in otherwise non-offset forming species that are capable of vegetative increase. This character, of course, is valuable because it provides a more rapid means of increase in a garden or nursery setting. Another interesting find was a single cream-colored flower mixed in with the thousands of normal yellow flowered plants of E. grandiflorum at Catherine Creek. This was not an albino (which would be pure white), but rather creamy white, similar to the flower color of E. oregonum ssp. leucandrum. Since E. oregonum does not occur in the eastern part of the Columbia River Gorge, hybridization is not a possible explanation for this unusual flower color. I should also note that the color is not all that similar to E. grandiflorum's white relative, Erythronium idahoense. 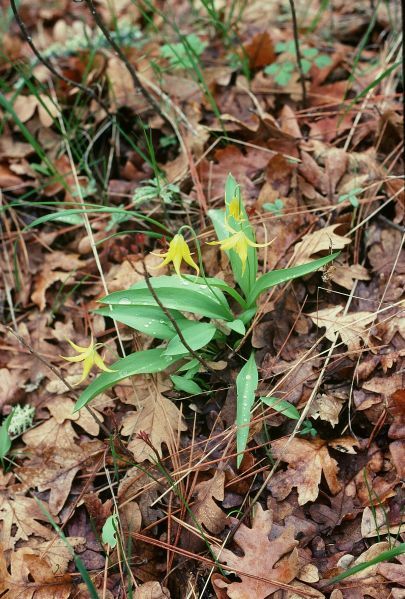 In fact, Erythronium idahoense is one of the species I visited in April 2005, and will be a subject of next month's installment of "My Erythronium Big Year"